Finally another tutorial. I did up a few ATC's a few posts back and I used this technique to make them. My ATC for Beginners groups wanted me to show them how I did it so here it goes. 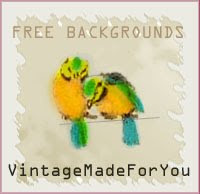 This is NOT my original idea, this is just a visual tutorial for anyone that wants to learn how to make great textural backgrounds using fibers, ribbon, cheesecloth, or any kind of material bits you want . 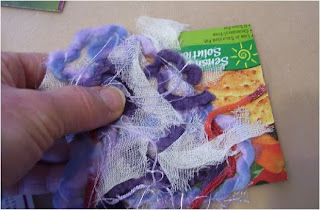 This tutorial is dedicated to my good friend Jenxo from Australia who loves making fabric ATC's and does wonderful fiber arts. 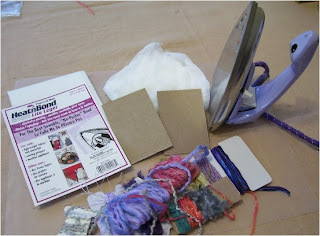 You will need an iron, ATC sized chipboard or cardboard sizes for your base, materials, fibers, ribbons, I have cheesecloth here, or gauze depending on where you live, and of course fusible webbing. 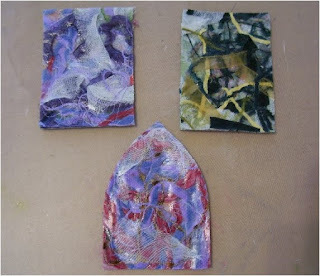 You may also use embossing powders although I tried it and didn't really show up for me but you can try if you like. You could even place some sequins here and there if you want some bling. (Fusible webbing comes in rolls, sheets even tape. It is shiny on one side and has paper on the back of it which after heated comes off quite easily. Next we are going to cut 2 sheets for each card offusible webbing just a bit larger than the actual size of the ATC. Doesn't have to be a lot just as you see below. 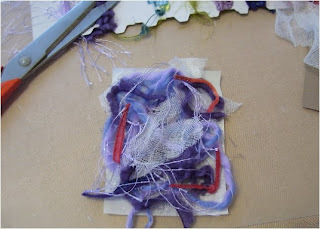 This is the fun part, cut up some fibers, ribbons, chunks of cheesecloth and choose colours that are pleasing to they eye. Make a nice nest like I have here on top of the shiny side (paper side down) of the fusible webbing. Don't worry to much if you have some bald spots, either cut a few bits more of ribbon or fiber and sort of just lay it in that area. Allow some of this to overhang or touch the edges of the fusible webbing. 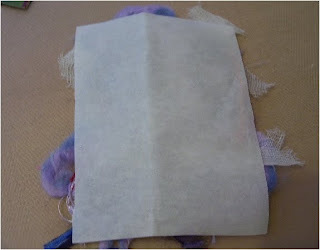 Now lay a piece of paper or cardboard or even a heat resistant craft sheet on top of the fiber. 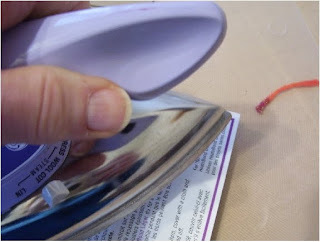 Using the cotton dry no steam setting, iron over the paper that is covering your fibers. Flip this over and iron over the paper side of the fusible webbing that the fibers were laying on. 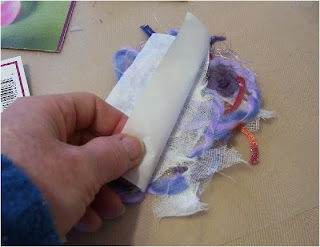 Now carefully remove the paper backing from the fused fibers( keep this paper on hand you will need it again). You can tell which is front and back as the front side is more appealing, you will also notice that after removing the paper the fusible webbing has a shiny surface. Do NOT place your iron directly on this surface. Now on the front side of the fibers which doesn not have any fusible webbing yet, you will use another piece and place it on the top side, iron it again and you are fused on both sides. 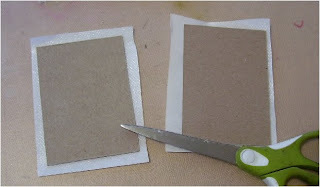 Now place the fused piece on top of your ATC chipboard or cardboard base and center is as best as you can. ( the back side of your fiber will be ironed onto the ATC sized cardboard base.) Remember you will have some fiber overhanging your cut piece of cardboard, this is good. 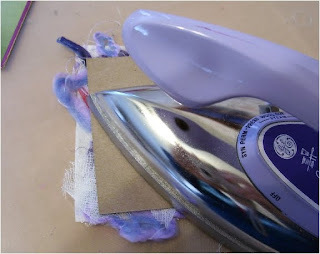 Place your papers that you peeled off from after ironing, overlapping them if need be, and use this to iron over your fibers on the front of the card. Keep the irong moving do not let it rest on one spot too long. Flip the whole thing card and all and iron on the back side of the ATC to heat the back of the fused fiber directly to the base ATC. Remove that paper that you placed on the fibers on the front of your card. 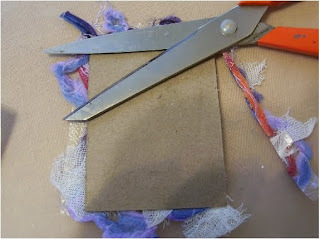 Now trim the excess fibers using the base of the card as your guide or if you want the fibers hanging keep them. You decide. Here are 3 examples of fused fibers. The direct left is the one I just finished on this tut, the green one is green fibers, gold ribbon and some nice yellow thin fibers and some cheesecloth and the bottom is similar chunky fibers, cheesecloth and various other bits. I hope you enjoyed this fiber tutorial. If you have any questions or want to give me some feedback on my presentation please feel free to leave me a comment. Watch for my next tutorial on inkjet transfers, done with no stress. 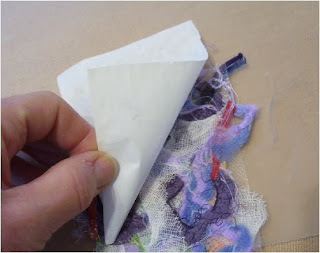 one thing tho, always wait for your fusible web to cool down before you peel the paper off, that way you wont take off any of the sticky stuff. Thanks for a wonderful tute Les, Great pics and explanations. Your examples were fab too! Happy New Year Lesley - wow that's a lot of work in your ATC - but how fab it turns out. 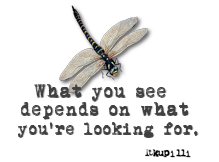 Course you can join in with inchy challenge - there's no sign up you can just join in a letter when you feel like it or even add your old letters so that you eventually get a full set! Looking forward to seeing your B! Very good tut Les. End results are beautiful and and can tell one could go crazy with this. Great photos and such a big help to first timers. Thank you so much. Great tutorial.... looking forward to the next one too - transfers have always been a bit of a mystery to me! A brilliant tutorial, with loads of useful tips and hints at how to do it well. I feel confident enough to have a go as you have done such a marvellous step by step guide. Sometimes, especially in magazines, the instructions are so vague that you make a right hash of it without realising that a lot of steps are missed out or glossed over. And nobody ever tells you what type of glue to use! !